This week's weird pick brings the spotlight back on an oldie but a goodie, support Ashe! With her world famous initiation technique on her ultimate, she's definitely an interesting selection as a support, if not fully accepted. As a whole, Ashe is a champion with undeniably amazing utility. However, without escapes, she can be too squishy to be effective in a world full of assassins. As a support, teams can take advantage of her utility while building her to be quite tanky, eliminating her weaknesses while still taking strong advantage of her skillset. The ever useful full map stun once every 48 seconds at max CDR. As a support, I think that both blue trinket and yellow support items are viable choices on her depending on your playstyle. 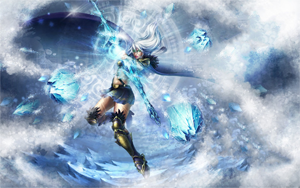 Although she won't be able to fully utilize the blue trinket's AP until later on in the game (100% AP ratio on her ultimate), her poking ability allows her to use its gold generation property very well. Key items include Sightstone, Frozen Heart, Locket, and possibly Zeke's Herald. If you want to take on more of a damage role, Blade of the Ruined King is a good choice. I wouldn't recommend getting Morello on her, as it only procs under 40% via magic damage, which is only available to her using her ultimate. All in all, I'd say that support Ashe is likely much more viable than it sounds, especially in a world of tank junglers coming back into play. With her kiting abilities, a late blade of the ruined king would also work wonders as a peeling method to keep your ADCs alive. Her enchanted arrow can also be used as an amazing initiation or follow-up tool that chains very well with pretty much anybody. Although lacking hard CC early on, she definitely makes up for it after level 6. Yeah, blue and yellow support item is what he meant. Threw me off for a second trying to figure out why the blue 'trinket' has anything to do with AP scaling lol. I've used Ashe Support in the past. It's a good pick if the other team isn't playing with assasins. I remember a game I played almost a year ago where I got my Vayne fed with the most absurdly lucky ult stuns from the fountain or some other place across the map. Morellonomicon is bad but IIRC Ashe's W will proc Liandries. Hey you should do a weird pick for Cho'Gath mid? Ashe support literally has 0 chance against supports like blitz, thresh, and leona. Pretty much has 0 chance against anything really unless you are playing a brain dead bot lane. Hey, you should try AD assassin Rammus top. With his naturally high mobility, he can easily run down opponents and hold them in place via his taunt (which also reduces armor) as he smashes them with a few crits. That's why she's tier 4, and Leona and Blitz are God tier. SSJ can you recommend runes and masteries that I can try with it? Runaan + Black Cleaver can works very well with Ashe support. It was only really viable when Sword of the Divine was an item, IMO. Sword of divine Rammus was such a fun troll build with IE, thorn mail and atma's if you liked that. So much better after they fixed the CC overlap bug so people couldn't escape in between the knock up and the silence. Wukong mid would be a pretty good idea for the next edition of weird picks don't you think ssj? You aren't weird wukong only. You are god. works pretty fine if the enemy has not many assassin and not all in Supports like Leona. Blitz and Thresh's engages can be countered with smart positioning (keep behind minions, watch the minion's health). That said, Leona with a capable ADC would crush her.